N addition (56, 156, and 206 kg N ha−1 yr−1as dissolved NH4NO3) method (canopy vs soil) did not affect the biomass of N2-fixers (Acacia mangium Willd. and Ormosia pinnata Lour. ), but significantly affected the biomass of non-N2-fixers (Schima superba Gardner & Champ., Pinus massoniana Lamb.). Coniferous species exposed to N addition on the canopy rather than the soil had higher N accumulation. Previous experiments simulating nitrogen (N) addition in forests were conducted by adding N fertilizer directly to soils, which neglects the fact that N uptake can be done by canopy leaves. The objective of this study is to examine how different N addition methods (canopy vs soil) affect growth and N accumulation of four subtropical tree seedlings. An open-air greenhouse experiment was conducted to expose four tree species (Schima superba Gardner & Champ., Pinus massoniana Lamb., Acacia mangium Willd. and Ormosia pinnata Lour.) to different N addition methods (canopy or soil) and N levels (ambient, medium, or high). N addition method affected the biomass of non-N2-fixers (Schima superba Gardner & Champ. and Pinus massoniana Lamb. ), while N2-fixers (Acacia mangium Willd. and Ormosia pinnata Lour.) were unaffected. N concentrations in the soils and leaves of all trees were significantly increased by the medium and high N additions, and soil N concentrations resulted from N addition via soil rather than the canopy. Although leaf N concentration was significantly affected by N addition method in all trees except for Ormosia pinnata, only N accumulation in Pinus massoniana was significantly affected by N addition method. 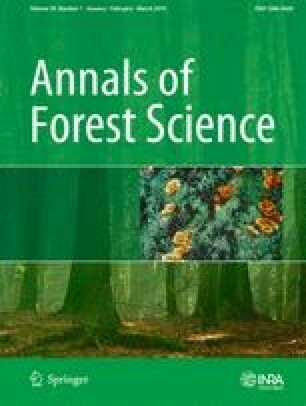 N addition method affected the biomass of non-N2-fixers and N accumulation in coniferous species, while it did not affect the biomass of N2-fixers and N accumulation in broadleaf species. Project preparation: Liu JX. Experiment design: Huang WJ. Experiment work: Li YY nad Lie ZY. Data analysis: Lin W and Wu T. Manuscript draft: Liu JX and Wu T. Manuscript editing: All authors have studied and approved the final manuscript. This study was jointly funded by the National Natural Science Foundation of China (Grant Nos. 31570482, 31670487 and 41430529), Key Research Program of Frontier Sciences, CAS (Y621231001), and the Guangdong Hundred, Thousand, and Ten Thousand Talents Program.